TODAY is April 4th, the 51st anniversary of the assassination of Dr. Martin Luther King, Jr. 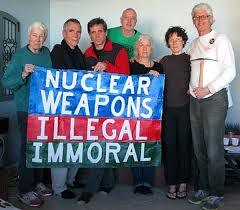 It is also the first anniversary of the action of 7 Catholic peace activists to symbolically disarm nuclear weapons at the Trident Submarine Base at Kings Bay, Georgia. Most, if not all, of the Kings Bay Plowshares 7, as Catholic Workers, are also by default war tax resisters, since they live below a taxable income. Not paying taxes for war is a baseline value for the movement founded by Dorothy Day. One of the KBP7, Martha Hennessy, is Dorothy Day’s granddaughter. The seven activists chose April 4th, 2018, as the day for their action at Kings Bay precisely because it was the 50th anniversary of Dr. King’s assassination, and they wanted by choosing that time to act to highlight the three triplets of evil – poverty, racism, and militarism – which Dr. King had himself pointed to in his famous “Beyond Vietnam” speech, also delivered on April 4th, in 1967, exactly one year before his death. The Kings Bay Plowshares 7 conducted a typical Plowshares action, cutting through fences to get onto the Base, going to relevant sites (the nuclear bunkers and a “shrine” to nuclear weapons), pouring their own blood, holding signs, writing on buildings, and hammering on the “shrine”. They were arrested and face charges in Federal District Court in Brunswick, GA, which could result in up to 25 years in prison. As of this writing, 3 of them are in jail in the Glynn County Detention Center in Brunswick, while 4 are out on bond, with ankle bracelets and daily curfews. No trial date has been set, but motions and hearings for dismissal of the charges have occurred. One of the grounds for dismissal claimed by the KBP7 is the Religious Freedom Restoration Act (RFRA). This makes their case especially interesting for war tax resisters, since WTR’s have been making those same arguments for decades. The National Campaign For a Peace Tax Fund was involved in the campaign to get RFRA passed and, of course, its proposed legislation is named the Religious Freedom Peace Tax Fund Act. Unfortunately, the Supreme Court, in rulings on RFRA, has been inclined to use it to defend discrimination based on religious belief, while specifically stating that it can’t be applied to nonpayment of federal income taxes (cf. the final paragraphs of the Hobby Lobby decision). It will be interesting to see if the KBP7 fare better in their RFRA argument. Regardless, their raising of the matter resulted in two extraordinary days of hearings in November 2018, in which all seven defendants and two expert witnesses schooled the Court on Catholic social teachings and on their personal application of those teachings to the disarmament of nuclear weapons. I would urge all readers of this blog to spend some time with their original affidavits (Declarations), supplemental briefs, and Jeanine Hill Fletcher’s testimony, links to all of which are available on the KBP7 web site here. Currently, we are still waiting for the Magistrate Judge to issue his recommendations on the motions to dismiss to the District Court Judge. You can keep up with all of this by following the Kings Bay Plowshares web site and their Facebook discussion group. The latter contains many more general posts about nuclear weapons and power. I should add that the Kings Bay Plowshares 7 Support Team, of which I am a member, is celebrating the first anniversary of their action with the launch of a global petition for the dismissal of the charges against them. Go to the KBP7 web site linked to above and click on the link to sign the petition. You’ll recognize a number of the notables who have already signed on to it. Way to go Robert for doing frontline support there. (I was talking to someone here in NYC the other day about the KBP7 and mentioned you, and they said “wow, you know Robert Randall? !” So you must be doing great work there too.) It will be interesting to see how the judge responds to the RFRA arguments. I’ve found that many of the Plowshares/CW/support folks don’t realize how often WTRs have tried to use it.